The KPA leadership meets routinely to evaluate the peace process, security, development, and the political situation in Aceh. The leadership agrees there has not been a significant advance in Aceh’s development in light of the available resources. In advance of the 2011 executive elections, KPA is evaluating possible candidates, especially those associated with Partai Aceh, but looking for coalition opportunities with other political parties. For the governor’s race, Partai Aceh will not join in coalition with other parties, whereas for a number of districts and municipalities, Partai Aceh remains wide open for coalition opportunities. KPA nominates Dr. Zaini Abdullah and Muzakir Manaf as Partai Aceh’s candidates for governor and vice governor respectively for the 2012-2017 period. There had long been speculation that the nomination would go to Dr. Zaini Abdullah, the Foreign Minister for GAM’s government in exile in Sweden and the older brother of Hasbi Abdullah, current speaker of Aceh’s parliament. The surprise was in choosing Muzakir Manaf, who never professed an interest in running for office and preferred to focus on his lucrative post-conflict business opportunities in Lhokseumawe. Earlier rumors suggested that PA/KPA would choose Aminullah Usman, a former banker, reminiscent of Indonesian President Susilo Bambang Yudhoyono’s choice of Boediono for his Vice-President. The loser here, it would seem, is Aceh’s current governor, Irwandi Yusuf, who was hoping for Partai Aceh’s nomination, but will definitely run for reelection nevertheless. Adding insult to injury, during the press conference Muzakir Manaf called on Irwandi not to run, so that the GAM conglomerate will speak with “one voice” in the next election. That’s extremely unlikely, since Irwandi still leads most polls in a race that for the moment unofficially also includes the current Vice Governor Muhammad Nazar, the rector of Syiah Kuala University Professor Darni Daud, sociologist and human rights activist Otto Syamsuddin Ishak, and the former bupati of Aceh Utara Tarmizi Karim. The Zaini-Muzakir ticket might be a game changer if PA/KPA can get their rank and file—and their effective field operation—to fall in line and get out the vote. Within hours of the KPA/PA announcement, the supposed spokesperson for Partai Aceh, Tgk. Ir. 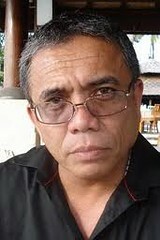 Linggadinsyah, issued a fierce rejection of the Zaini-Muzakir nomination. Linggadinsyah accused the senior KPA/PA leadership of nepotism and rejected their anti-democratic approach to the nomination, claiming that 20 out 23 district level KPA/PA leaders do not support the Zaini-Muzakir ticket, and vowing their continued support for Irwandi. Linggadinsyah’s statement should be taken with a grain of salt, however, and not just because he has been mentioned as a possible running mate for Irwandi. The next day Muzakir Manaf called Linggadinsyah an illegitimate spokesperson for PA using the loaded religious term haram (meaning not just “illegitimate” but also “forbidden”), because he was relieved of the job three months ago! Beside Muzakir Manaf stood Darwis Jeunib, the KPA district commander from Bireuen, who was supposedly one of Linggadinsyah’s 20 local commanders opposed to the Zaini-Muzakir nomination but said he had no foreknowledge of Linggadinsyah’s protest and would never disobey KPA’s commander, apparently throwing his loyalty to Zaini and Muzakir. Welcome to the latest chapter of the GAM conglomerate’s long history of internal rifts. Irwandi doesn’t have to explain who “they” are because everyone knows about the longstanding fault lines within the GAM conglomerate. KPA/GAM held their press conference at the home of Meuntroe Malek Mahmud, who heads “old GAM” ever since Hasan Tiro became too infirm to continue his movement for independence. Since the peace agreement, Malek Mahmud has moved back to Aceh, and is most likely the inheritor of the title of wali nanggroe since Tiro passed away last year. Together with Zaini, these are the Sweden guys who have come home to take (what they assume is) their rightful place at the highest levels of power in post-conflict Aceh. They do not get along with Irwandi, who in 2006 won the governor’s race because he was quite frankly closer to the young generation of rank and file combatants during the conflict. They mobilized for Irwandi and defied all observer expectations at the time when he won. For all his shortcomings, Irwandi is correct when he states that he has been more accessible than the detached leadership in Sweden, who by all accounts make imperious decisions and do not feel the need to answer for them. This is why KPA/PA’s strategic decision to recruit Muzakir Manaf as the candidate for vice governor could be a game changer. As the former commander for all of GAM’s ex-combatants, Muzakir Manaf is one of a small handful of leaders within the GAM conglomerate who could bring the younger foot soldiers in the movement together with the old GAM leaders to speak with “one voice.” Even if Linggadinsyah was correct when he said that KPA/PA leaders out in the districts are unhappy with the central leadership in Banda Aceh, Irwandi loyalists will have to think twice if it means they have to campaign and vote against their former commander. This is only one week’s snapshot in an early phase of the election cycle. Maybe KPA/PA are only testing public reaction. We can expect many twists and turns in the coming months, particularly as the other candidates start to formally campaign. Both the 2006 executive elections and the 2009 legislative elections were preceded by dozens of violent events, rampant money politics, and massive voter intimidation. It will be interesting to see how much this pattern repeats itself in 2011 as post-conflict Aceh slowly gets comfortable with its transition to peace and democracy. Edit 19 June 2011: For an update on these issues, please see the excellent International Crisis Group report titled “Indonesia: GAM vs GAM in the Aceh Elections” published on 15 June 2011, plus my notes on the ICG report posted HERE. This entry was posted in Aceh, Conflict, Indonesia and tagged Aceh, Aceh Party, Aceh Transitional Committee, Aminullah Usman, Banda Aceh, Boediono, conflict, Darni Daud, Darwis Jeunieb, democracy, democratic transition, elections, executive elections, Free Aceh Movement, GAM, GAM conglomerate, Gerakan Aceh Merdeka, governor, gubernatorial election, gubernur, Hasan Tiro, Hasbi Abdullah, Indonesia, Irwandi Yusuf, Komite Peralihan Aceh, KPA, Linggadinsyah, Meuntroe Malek Mahmud, Muhammad Nazar, Muzakir Manaf, Muzakkir Manaf, nepotism, Otto Syamsuddin Ishak, PA/KPA, Partai Aceh, peace process, pilkada, postaweek2011, SBY, Serambi, Serambi Indonesia, Susilo Bambang Yudhoyono, Syiah Kuala University, Tarmizi Karim, Taufik Al Mubarak, The Globe Journal, UNSYIAH, wali nanggroe, Zaini Abdullah. Bookmark the permalink. It is interesting to note that Irwandi’s SMS to Serambi included the statement: “Aceh’s prestige has gone up in the eyes of Jakarta”. It is probably an indication of his time in office that he identifies Jakarta as an ‘audience’, but Jakarta is not a voter. I imagine that identifying oneself with Jakarta does not play well with the electorate; the GAM identity is defined by its opposition to ‘Jakarta’. The Achanese identity is equally influenced by the romantic vision of rebellion. I recall Irwandi’s 2006 elections posters (him in full traditional dress), drew heavily on the Achanese identity. He was savvy enough to run as the ‘identity’ (Achanese) candidate, which makes his reference to Jakarta appear to indicate that he may now be a better Governor than politician. Irwandi may still have to learn a key lesson of democracy, voters do not reward past performance. Muzakir Manaf may also have to learn this lesson, but he has the advantage of not being associated with any sense of disappointment in the post-conflict development. He also has the ‘emotional’ vote, connecting people to their rebellious identity. Just compare the two photos of Irwandi and Mazakir Manaf in your piece, who would you vote for? Irwandi’s best move would be to invite Mazakir to run with him as the Vice Governor. Mazakir’s best response would be to invite Irwandi to be his Vice Governor candidate. That ticket would really make for an interesting election. thank you. this information is very2 important. There is not much information on Aceh politics in English, and this blog is execellent. I believe the governor election is only a few months away. How is panning out? I just hope there will be political stability follow by economic stability after the terrible natual disaster. Regards, Perth.